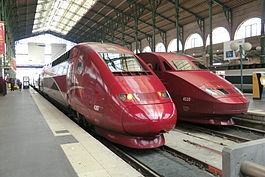 The Thalys PBKA is a high-speed train derived from the French TGV. It operates the Thalys service between Paris, Brussels, Cologne (German: Köln) and Amsterdam, forming the abbreviation PBKA. Unlike Thalys PBA sets, the PBKA sets were built exclusively for the Thalys service. Their motor cars are technologically similar to those of TGV Duplex sets, but the trains do not feature bi-level carriages. They have eight carriages and are 200 m (656 ft) long, weighing a total of 385 tonnes. They have a capacity of 377 seats. All of the trains are quadri-current, capable of operating under 25 kV 50 Hz AC (LGVs and a part of the French lignes classiques), 15 kV 16.7 Hz AC (Germany), 3 kV DC (Belgium) and 1.5 kV DC (the Netherlands and the remainder of the French lignes classiques). Their top speed in service is 300 km/h (186 mph) under 25 kV, with two power cars supplying 8,800 kW. When operating under 15 kV AC or 1,500 V DC, the power output drops to 3,680 kW, insufficient to reach 300 km/h in commercial use. Although their power-to-weight ratio allows a 250 km/h operation under 15 kV AC, further constraints resulted in imposing a limit of 200 km/h on these trains in Germany. Seventeen trains were ordered: nine by SNCB/NMBS, six by SNCF and two by NS. Deutsche Bahn contributed to financing two of the SNCB sets.